The last thing you’d want to worry about is the whole interstate removals process. We suggest you make a smart decision and leave it all to us, Roadways Furniture Removals – Australia’s foremost furniture removalists– to make life easy for you to cope with all your Melbourne to Darwin removalists. Moving from Melbourne to Darwin is a total change of work and lifestyle. Setting up a new home in a new state can be difficult. Naturally, you will have many things to deal with before making the move. Pre-packing- You can’t just toss your precious belongings onto a truck and cart them off over 4000kms to Darwin. Everything has to be packed properly to ready them for transportation – that’s pre-packing, the most crucial part of moving interstate. Our professionals are trained and will pack your furniture and household items with great care so that they can be moved safely. Backloading – Turn to our interstate backloading service to save money. You do not have to hire an entire truck anymore to transport your furniture. By paying for only the space you need, you can share your expenses with other clients who are also transporting their belongings to Darwin. Piano Removals – Pianos are nice to play but a big headache when it comes to moving. Piano removals call for special skills, and the use of special tools and equipment. We have specially designed piano removals trolleys, crates and haulers to ensure 100% safety of your proud possession. Vehicle Transport – Darwin is more than 4000 km away from Melbourne and you may not wish to drive for that long a distance. Hand over to us your precious car/bike and we’ll have it safely and cheaply transported to your new home through our network of professional interstate vehicle transport specialists. Travelling across the length of Australia is an adventure! 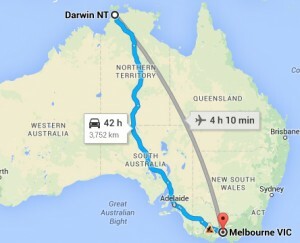 Let our Melbourne to Darwin Removalists make the road easy for you. Call Roadways today!